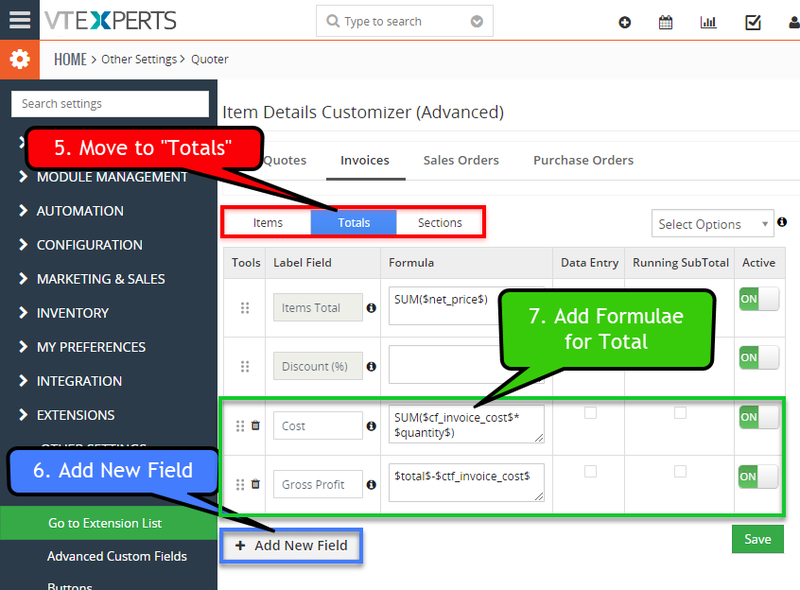 In standard VTiger 7 and VTiger 6, there are no tools to calculate profits on individual Quotes, Invoices, Sales Orders, and Purchase Orders. Calculating a profit can be as simple as deducting cost from total of each product as well as whole invoice or may go complex if added taxes, adjustments, shipments, additional services etc. Anyways, this is a big issue for every level organization. Using Item Details Customizer Advanced for VTiger 7, or Profit Calculator for VTiger 6, you can calculate profits per sale, product, day, and more. This is done by utilizing the “Cost” field on products and services in VTiger. You can adjust costs, apply discounts, and calculate potential profit. The profit is stored in VTiger field and therefore reportable. Let’s see how can we configure Profit Calculation in VTiger 7 using Item Details Customizer Advanced. Under “Items”, Add New Column for the cost and select fields “Purchase Cost” from Products and Services. This is a mockup of how the calculation should look. In above protocol, we didn’t apply any tax to make it a simple read. But the same can be accomplished if you need to apply taxes. For that purpose, use the same logic as above with the tax applied. It will calculate the gross profit in the same manner. We used “Total” for our calculations. However, for companies, there can be handling and shipment, service charges, additional warranty/repair duration, add-ons etc. If you use some or any of those extra charges, simply use the “Net Price” field instead of “Total”. The rest will be taken care of. 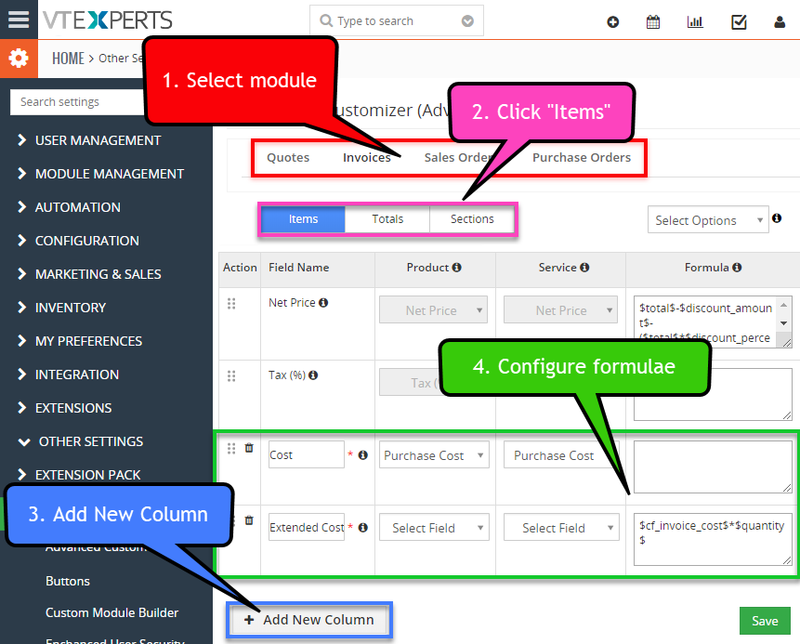 To learn more, please see our user manual for Item Details Customizer Advanced extension. The extension is included in the Extension Pack and is available for all our subscribers. 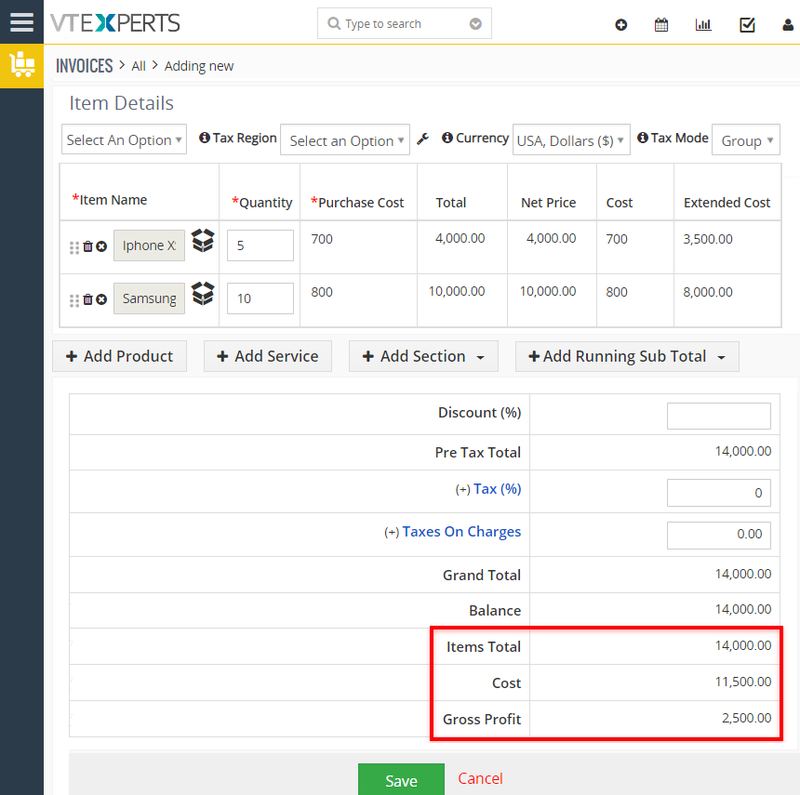 If you need more information or have questions, send us an email at [email protected] or visit www.vtexperts.com for live chat – we usually respond within 24 hours. Please note that we design our extensions to be as flexible & configurable as possible, so if you feel uncertain if this would work – email us and we’ll be pointing you to the right direction. Also, we can add features or can customize extensions to meet your needs and make sure you will be up and running in no time. If this extension is “almost” what you need – we can work with you to make necessary changes so it is “exactly” what you need.